With every Victorian topic I take up, I am continually amazed at how similar we are to the Victorians. In addition to tackling several of the same weighty social and political issues, many of our social customs and traditions were handed directly to us from the Victorians. For example, at the beginning of the 19th century, Christmas was hardly celebrated at all; however, by the end of the century, it became the biggest annual celebration in England and was accompanied by many of the same traditions that we have retained today, including the Christmas tree (“History of Christmas“). However, our Christmas customs aren’t the only things that we have inherited from the Victorians. Our weddings, christenings, and funerals are all marked by the Victorian love of ritual and tradition. For the Victorians, these were events of incredible import, and since the mortality rate, particularly for children, was so high, funeral traditions gained particular importance as the century progressed. For the wealthy, the burial of a loved one was as much about “being seen” and doing things “properly” as it was about the process of grief and mourning. However, things were a little different in the lower classes. Because the death rate (particularly for children) was so high, many lower class families would plan ahead and save money to ensure that the deaths of their children would be handled in an appropriate manner. Funerals were so costly, yet so important, that lower class families often went without the necessities of life because the family refused to spend their funerary funds on things like food, clothing, and shelter. Ironically, by refusing to use the money at their disposal to help ensure the survival of their children, families were almost ensuring that they would need their funeral funds. This seems completely foreign to us – how could parents starve their children to ensure that they could bury them? The necessity of burial money was perpetuated by several fears, fears relegated primarily to the poor. Families who were unable to provide for a proper funeral and burial of their loved ones were forced to rely on the local Poor Union who would provide the bare minimum in burial – a pauper’s funeral. The Poor Union buried those unable to afford their own services in a common pauper’s grave, without a headstone and with very little ceremony. 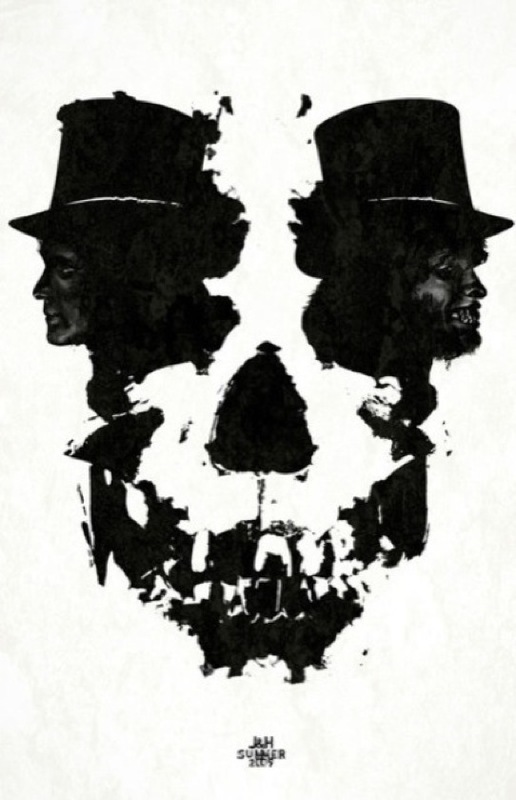 Charles Dickens’ Oliver Twist gives one of the best literary descriptions of a pauper’s funeral when Mr. Sowerberry, the undertaker, arranges the burial of a poor woman in the parish, which includes the bare coffin, the workhouse pall bearers, and the mourning garb (a ratty looking cloak) lent to the husband and mother. He also describes a delay during which ‘local boys played a noisy game of hide and seek among the tombstones, or varied their amusements by jumping backwards and forwards over the coffin’ (Jupp and Gettings 224). With descriptions like this, it is clear why people feared for their loved ones. Families went to great lengths to ensure that the eternal rest of their loved ones remained undisturbed. Iron fences were erected around burial plots, and people were buried in double and even triple coffins. A wide range of different gadgets were also invented and used to prevent the prying off of the coffin lid (Jupp and Gettings 224). All of the safe-guards were expensive and out of the reach of many of the lower classes; however, they could minimize the chances of body-snatching with a proper burial. Another very real concern was due to the Anatomy Act (1832), enacted to combat the body-snatching. 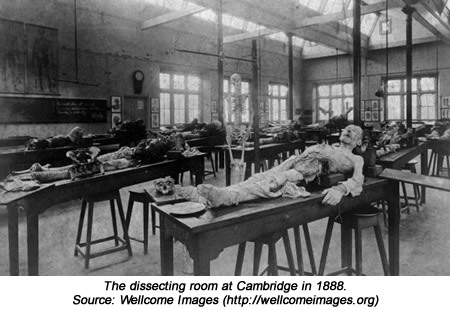 This law legalized the dissection of people who died in prisons, asylums, or workhouses. Unless a relative came forward within seven days of an inmate’s death, prepared to pay for a coffin and a churchyard burial, the inmate’s body could legitimately be sent to a teaching institution for dissection. This “donation” would be made in return for a fee to be utilized in the institution from which the body came (or pocketed by a corrupt institution official). Because of the incredibly high demand for cadavers, there was a great deal of corruption existing in the system. This law (and the shady practices which accompanied it) made it much more likely that lower class individuals without the money for a proper burial would end up on a dissection table, lending greater fears about the final fate of a deceased family member (Brine). Unfortunately, just like most things, these clubs were abused and mismanaged, leading to their collapse and dissolution. There were suggestions that parents would enroll their sickly children in several clubs, each of which would pay the assigned benefits without knowledge of the others. There were even reports of parents neglecting or downright murdering their children for the club benefits; however, many of these reports suggest more sensationalist reporting and overstated middle-class concerns than actual evidence (“Burial Clubs”). Even though the life expectancy was improving for the middle and upper classes, death was still around every corner for the lower classes. These individuals took whatever precautions (effective or not) to protect themselves by ensuring that the deceased’s spirit found its way to the afterlife and didn’t stick around to take anybody else with him. The family would draw the curtains and stop the clocks at the time of death to mark the exact moment the deceased had expired. They would use crepe or veiling to cover the mirrors throughout the house to avoid trapping the spirit of the deceased in the looking glasses. Family photos were also turned face down throughout the house to prevent the deceased person’s spirits from possessing relatives and friends. If several members of the same family died, everyone and everything that entered the house would wear a black ribbon to prevent the deaths spreading even further. This practice would even apply to dogs and chickens. The family would hang a wreath of laurel and yew or boxwood, tied with black crepe or ribbons, on the front door as a signal to neighbors and visitors that a death had occurred (Friends of Oak Grove Cemetery). The bell knob or door handle would also be draped with black crepe, and tied with a ribbon – black if the deceased were married or aged and white if he or she were young or unmarried (Behnam). When the body was removed from the house, it was taken head-first, so that it would be unable to call others to follow it (Breyer). The duty of preparing the body for burial was taken care of by a friend of the family. The body would be washed and then, dressed as he or she would have been in life. Finally, flowers would be strewn around the face and throughout the coffin. Friends of the family took over many important duties including the greeting of callers, arranging details like meals, and seating guests at the funeral itself. Early in the century, wakes were popular, but as the century progressed, they lost their popularity, largely due to the drinking and mirth that often accompanied them (“The House of Mourning”). Funeral invitations were often sent out to those whose presence was desired. These invitations were engraved on a small square of paper with a wide black border and delivered by private messenger. It was also clear that an invitation to a funeral was not to be slighted. The funeral service itself was likely held at the house of the bereaved. The family was expected to view the remains before guests arrived, which made it imperative that guests arrive at their appointed time and not earlier. The family would be seated in the order of relation to the deceased, closest relative at the head of the line, and whenever possible, they were seated in a separate room thus protecting any show of grief from the eyes of their guests. 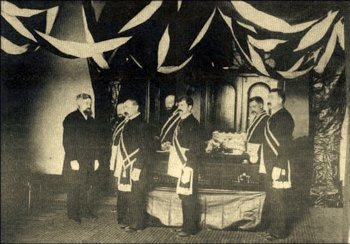 If the service was to take place at the deceased’s home, the coffin would remain open so that guests could view the body before the start of the funeral; however, it was not opened in a church unless the deceased were so prominent and beloved that the house wouldn’t be sufficient to provide an opportunity for viewing by the guests. After the service concluded, the guests would remain in the house or church until the family and those attending the interment were escorted from the building in preparation for the procession (“The House of Mourning”). The funeral procession would vary based on the cost factor associated with the funeral. The first carriage in the procession would contain the clergyman and the pall bearers, six (maybe eight) intimate friends of the deceased who carry the coffin. 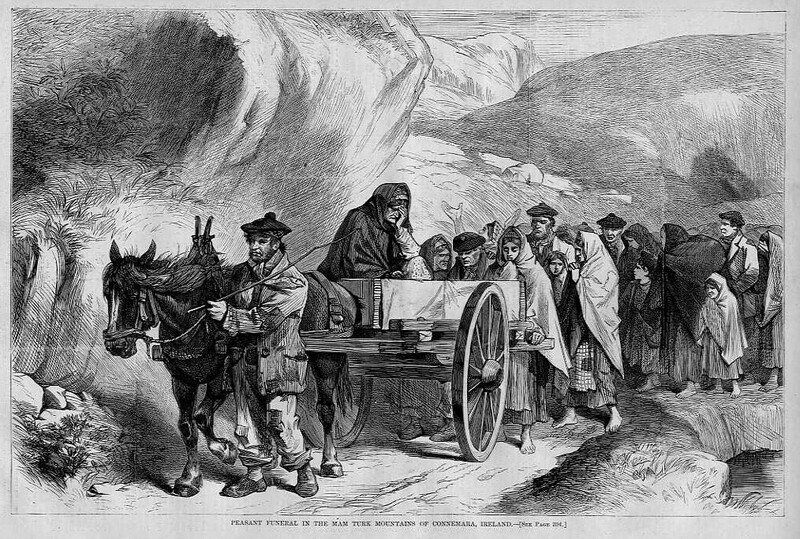 The next carriage would be the hearse, followed by the carriage of the nearest relatives, which would be followed by more distant relatives and friends (Alirangues). There were special elements that might be introduced into this basic lineup. If the deceased were a mounted military officer, his horse, fully caparisoned and draped in mourning, would immediately trail the hearse. If any societies of masonic bodies were involved, they would precede the hearse in the procession. (Incidentally, the Masons would have expected to make the arrangements and conduct the funeral according to their own formulas) (“The House of Mourning”). 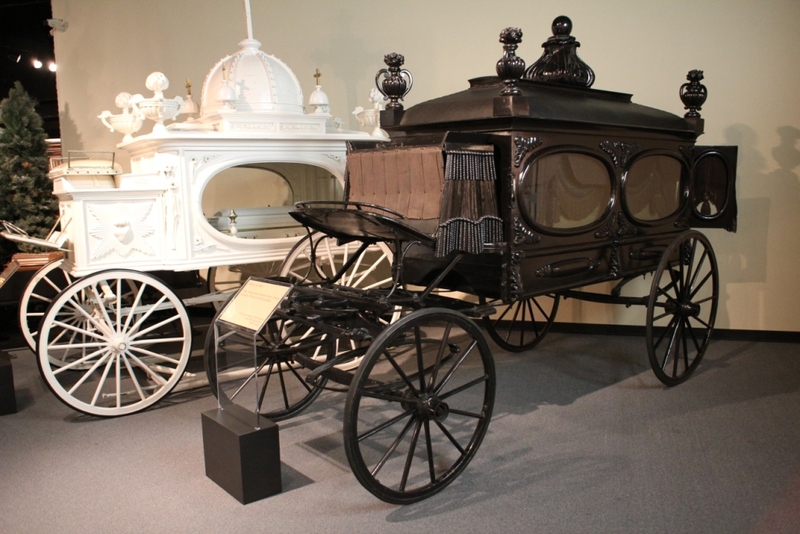 The basic Victorian hearse was an elaborate carriage, black or white (in the case of children), with glass sides, and silver and gold decorations. This basic layout could be dressed-up according to the prominence of its occupant or the purse strings of his family. Embellishments included multiple black horses drawing the carriage, velvet coverings for the coffin and the horses, ostrich plumes decorating every corner, horse, and attendant, or even an entire canopy of ostrich feathers covering the hearse. Flowers surrounded the coffin and would be visible through the glass windows. There were also smaller white hearses designed just for children. They were pulled by ponies and accompanied by mourners on foot instead of in carriages (Alirangues). The research on an appropriate mourning wardrobe got really complicated really fast, so I decided to look at one of the later articles I found advising those left behind on how to show “some outward degree” of respect for the dead. The article from Collier’s Cyclopedia printed in 1901 suggests some moderation in the mourning customs of the time period. It addresses the “new” habit of ignoring traditional mourning under the plea that “mourning of the heart, not mere outward woe” should be the practice. It suggests that in the case of “husband, wives, parents, brothers, sisters, aunts, uncles, and the nearer-related cousins” that some outward show of grief (more than a mere arm band of crape) must be adopted out of decency and respect to the memory of the deceased. Apparently, people had already begun to move away from some of the strict codes of mourning established by Queen Victoria’s long mourning of Albert. The article details the progression of fabrics acceptable, but dictates that whatever the dress was made of, it would have been trimmed in crape. The cut of the dress might have been in the latest mode, but the dress should have given the overall appearance of crape, regardless of the cut. The article goes on to suggest that widows would need at least two dresses, as their mourning period is the longest. It advises that the widow choose an older dress and have it covered in crape as an everyday garment, somewhat saving the better dress a little and renewing the crape on it whenever advisable. The article contains quite a lengthy list of the articles of clothing deemed necessary for a widow’s wardrobe. This isn’t surprising since a widow was expected to be in “deep mourning” for a year, and then transition into a second mourning, which lased for another year. As the widow transitioned, the amount of crape on her clothing diminished by degrees, but the ever present black would have remained (Collier’s Cyclopedia). 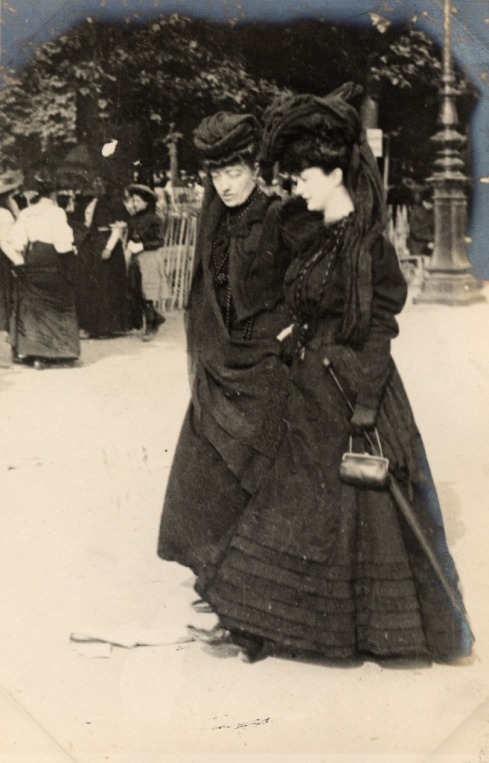 Obviously, the mourning attire was of great importance to the Victorians and is evident in their literature. Mary Barton discusses funeral preparations several times, which include Mary and Margret working on mourning outfits for “three girls beside the mother.” These were extra jobs which Mary and Margaret took in throughout the novel for a little extra money, but more so as a service to those who had lost loved ones. Mary comments that the black was awful on the eyes, so much so that Margret’s poor eyesight was sped on to its complete failure due to the amount of mourning she took in to sew. 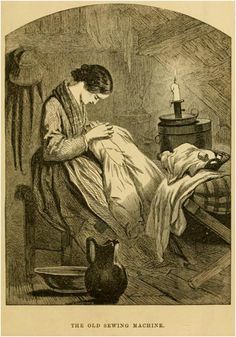 The practice of sewing the mourning, often for those who couldn’t afford it, brought them some peace and allowed them to bring comfort in a tangible way. The loved ones might be burying someone, but at least no one would look askance at them for not being dressed appropriately to do it. The same article offers rules of mourning for women’s “ornaments” as well. It requires that no ornaments be worn in deep mourning with the exception of jet (Collier’s Cyclopedia). Jet is also known as ignite and is a type of fossilized wood which became coal. It was utilized widely during the Victorian era as jewelry of mourning. Whitby jet was the most desirable and has since become quite rare. In addition to jet, another material became quite common in jewelry making of the time, the loved one’s hair. 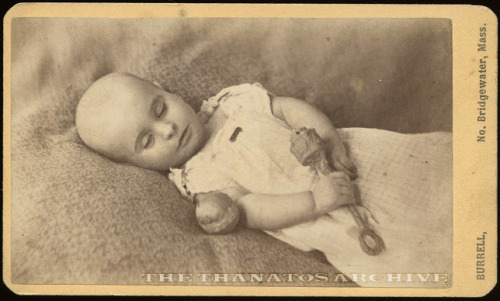 This seems macabre and slightly creepy to us, but it was perfectly acceptable in the second stage of mourning. The hair would often be woven into jewelry itself or encased in another form of ornament, like a locket or pendant (Twombly). These mementos were an important part of the Victorian mourning tradition, but just like everything else, there were those who minimized their social importance because of their lack of practicality. Dickens clearly saw all this fuss of mementos as unnecessary, as they were labeled “portable property” in Great Expectations and seen through the prism of their inherent value as opposed their sentimental value as a tangible way to remember those who had passed. Postmortem photography may be the single creepiest element of Victorian death and mourning. This was just one element of the memento mori (which translates to “remember your mortality”) sought by the Victorians. 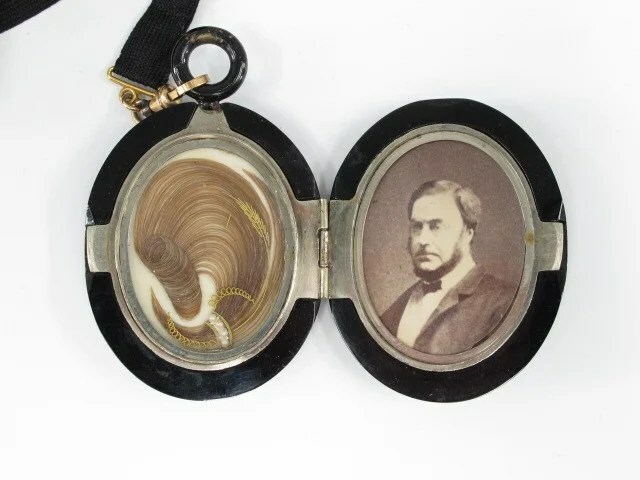 The advent of the less expensive daguerreotype photograph meant that poor families who couldn’t afford to have portraits painted of their loved ones, could now obtain images of their family members, even if they waited until after they were dead. This was particularly true of infants and children. 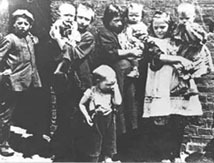 The child mortality rate was quite high, and children often died before there was time to obtain a photograph (Breyer). 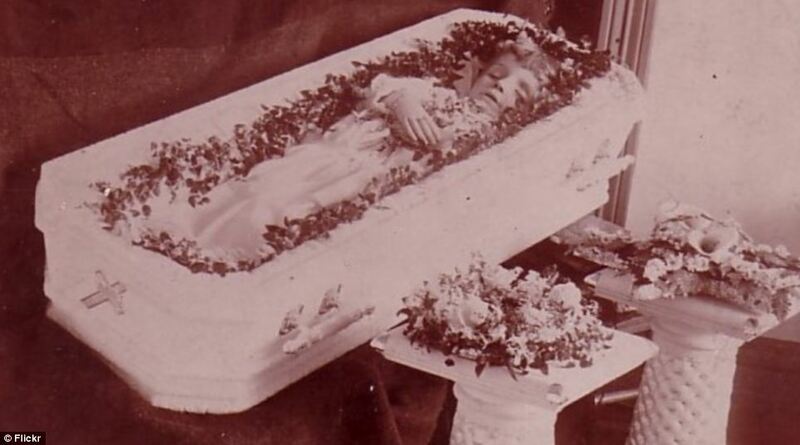 There were several ways of posing the dead in these postmortem photographs. The most obvious “pose” is that of the deceased lying in state in the coffin itself or in the bed where the body was placed on display surrounded by flowers. Although this seems the most appropriate pose to us, it was the least used by the families of the deceased. A common pose used for infants was in guise of sleep. Babies would be dressed and laid out as if they were napping for the photograph; however, while common, this one still wasn’t used as often as we would think. While photographing a dead body (in any pose) makes modern Western sensibilities a little uncomfortable, the third and most common form of posing was to place the deceased in a position mimicking life. This downright jangles modern nerves. This pose might include propping the deceased up on a stand in the midst of a family portrait setting or placing him or her in an environment and attitude that the deceased would likely have used in his or her lifetime. For example, a carpenter might be propped up on a stand in his woodshop with tools in his hands. For children, this type of posing would include flowers, favorite toys, and even family pets. Families and photographers would often go so far as to prop the eyelids open or paint eyes on the outside of the deceased individual’s closed eyelids. They might also add makeup to create the illusion of a rosy cheek. Some of these “special effects” would be added to the print after the photograph was taken and developed (Nelson). 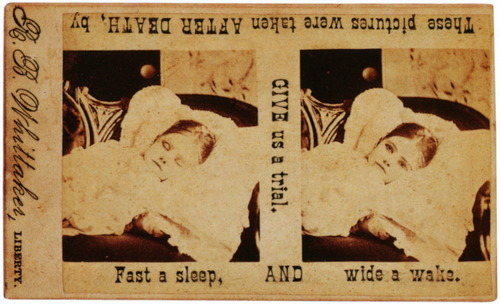 Click here for a slide show of some of the more common examples of Victorian postmortem photography. When we look at the rigid, rigorous, and macabre mourning and funerary traditions of the Victorians, we like to consider ourselves enlightened and superior to these foolish and superstitious people. The truth, however, is that many of the traditions we carry on in our own funerary practices are directly handed to us from the Victorians, especially in the South. Funerals are accompanied with an elaborate preparation of the body for “viewing.” If examined logically, no one should really want to see a dead body, especially the body of someone we barely knew. Yet, we file into funeral homes and march past the deceased and make comments like, “Doesn’t she look good?” Logic says, “No, she doesn’t look good. She looks dead.” However, we convince ourselves that this is way things are done. Like the Victorians, our funerals unwaveringly involve the wearing of black, the singing of hymns, and the consumption of vast quantities of food; anything else is simply inappropriate. 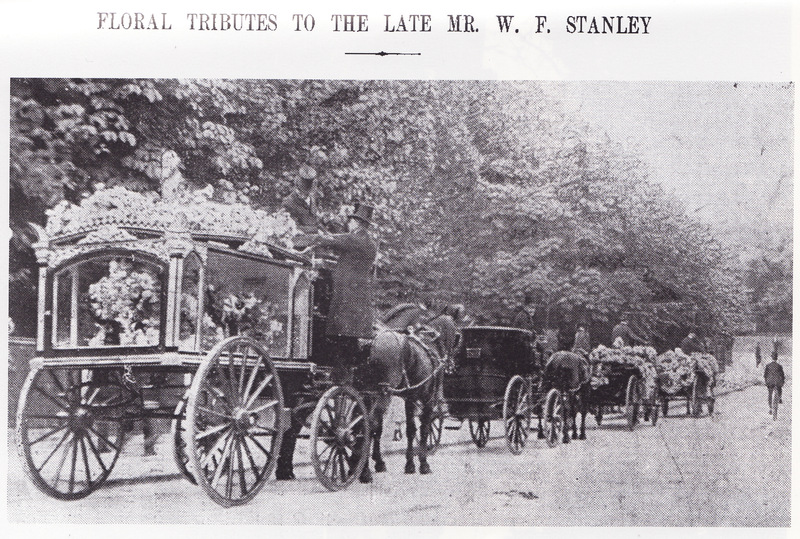 Our funeral processions are straight out of the Victorian playbook, except carriages have been replaced by cars. We practice the same order of “carriages” and use the same concepts of pallbearers and the separation of the family from the rest of the guests. However, if one really desires a return to the days of old, there is a modern day Victorian carriage service that offers horse-drawn funeral hearses called Madgwick’s (the irony of such a name would certainly not be lost on Dickens). As for the hair and memento jewelry, this might creep us out, but we aren’t too very far from this today. There are companies that offer the chance to turn our loved one into diamonds after his or her death. Granted, wearing a diamond is more appealing than wearing someone’s hair, but the premise is still the same. The more I learn about the Victorians, the more I’m convinced that we are they. We have taken the best (and the worst) that they had to offer and have made it our own. The pomp and rituals of death, funerals, and mourning will continue in the Victorian traditions, whether we give them credit for our habits or not. Benham, Georgene Corry. Polite Life and Ettiquette. Chicago: Benham, Georgene Corry, 1891. FuneralSource.org. The Funeral Source, 2001. Web. 27 Sept. 2014. Brine, M. E. “The Final Fate of the Poor – the Anatomy Act of 1832.” DevonHeritage.org. Devon Heritage, 19 Aug. 2009. Web. 27 Sept. 2014. Breyer, Melissa. “7 Most Morbid Victorian Mourning Traditions.” MotherNatureNetwork. MNN Holding Company, LLC, 17 Oct. 2012. Web. 27 Sept. 2014. George, Phil. “Burial Clubs.” HistoryHouse.co.uk. History House, 2013. Web. 27 Sept. 2014. 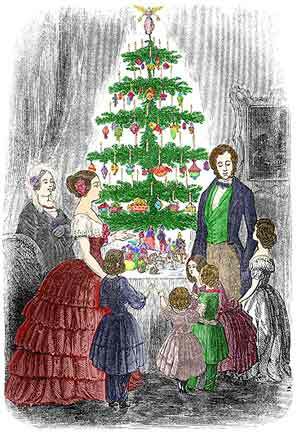 “History of Christmas.” Make Your Own Victorian Christmas. BBC, 2014. Web. 29 Aug. 2014. <http://www.bbc.co.uk/victorianchristmas/history.shtml&gt;. 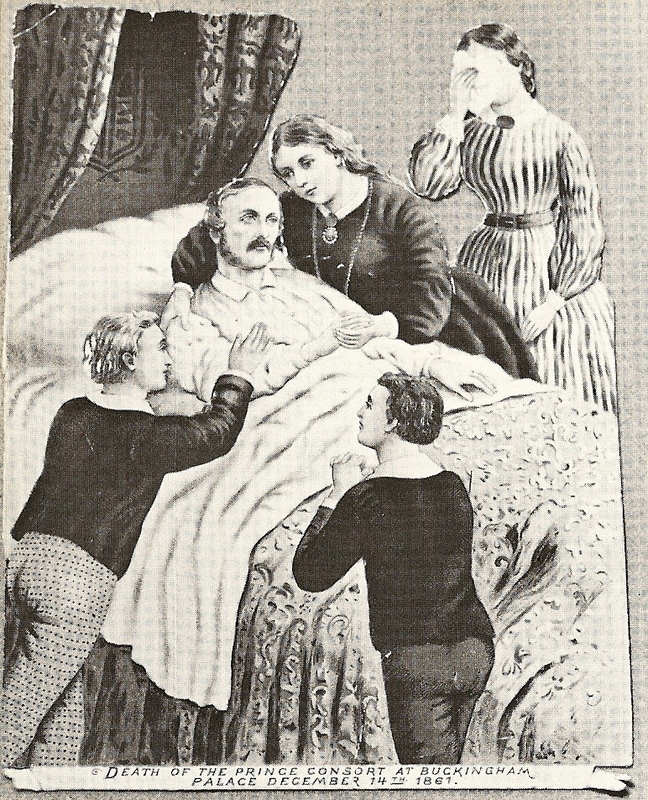 “The House of Mourning.” Polite Society at Home and Abroad 1891: n. pag. Victoriana.com. Victoriana Magazine, 2014. Web. 27 Sept. 2014. Jupp, Peter C., and Clare Gittings. Death in England: An Illustrated History. Manchester: Manchester UP, 1999. Web. Nelson, Sara C. “Memento Mori: How Victorian Mourning Photography Immortalised Loved Ones After Death.”The Huffington Post UK. AOL (UK) Limited, 30 Jan. 2013. Web. 27 Sept. 2014. Twombly, Andrea Guyoy. “Victorian Mourning and Sentimental Jewelry.” GuyoutBrothers.com. Guyot Brothers Company, Inc., 2014. Web. 27 Sept. 2014. “Victorian Mourning Customs.” Collier’s Cyclopedia 1901. QuiltHistory.com. Quilt History. Web. 27 Sept. 2014. Thank you for posting your sources!! Trying to do some research so I can write a paper on factors that contributed to the decline of Momento Mori Photography.. so much harder to find sources than I thought it would be! I found your facts on Victorian life fascinating and I think its answered my question! My ancestor died 1897 in a lunatic asylum he had come from the work house, I cant find his final resting place other that Kidderminster. On the documents from the asylum he had been there a week – he died of TB and they classified him as 3rd class. According to the asylum records he had a post mortem and the buried in Kidderminster. By this time his father had died and his mother was in the lunatic asylum herself- so I guess no money to pay for his burial. So sad! Thank you for writing in such a easy to follow way. A really informative site. About the only thing missing is an account of the funeral parlour itself (if such a place existed then) and the professionals involved. But an excellent site, as I say. My understanding is that the deceased was laid out in the “parlour” of the family home. Funeral “homes” today look like parlours in homes because they originally copied this concept of keeping the body at home until the burial. As communities grew it became necessary to have a larger place for the viewing and service, thus the funeral home industry became more widespread. US Immigrant communities after WWII still used the family parlour for preparation and viewing — I know because my neighbor brought me in to see her deceased grandpa when I was 5 — wow, did that shock me! The commercial funeral parlor also provided more sanitary preparation, which became more and more important to modern communities. The term of “undertaker” came from the person who “under took” charge of the deceased and funeral arrangements. Originally many of the early undertakers were cabinet makers or carpenters because they also made the wooden caskets, so this was a good second business for them. My name is Ralph L. Klicker, Ph.D. I am a faculty member of the Funeral Service Department at the State University of NY at Canton and Thanos Institute. I have written four of the textbooks used in most funeral service education programs in the United States and Canada. I am writing to request permission to reprint this article for inclusion in my new textbook, A Walk Through Time, A History of Funeral Service. Your article is excellent and I would be proud to include it in the selected readings section. I will cite the article in any manner you instruct. I would be glad for you to use the article. Do you have an email address I can use to contact you with citation information? Thanks! Are we our own monsters? Is Strength Holding on or Letting Go?